Indola are taking to the streets of the world for the inspiration behind their latest collection. The Street Style Collection consists of five different looks, Andro Mono, Colour Clash, Denim Folk, Graphic Pop and Urban Tribal. 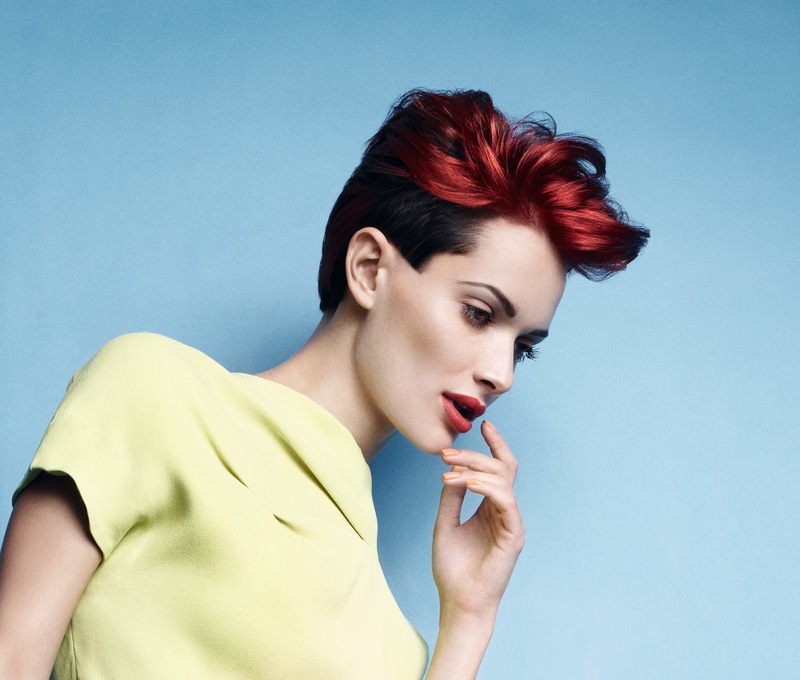 All using a combination of cut and colour to result in fresh, modern styling. They've created current looks led by Leonardo Rizzo and his team, simply by looking at trends as far afield as Beijing and beyond. Realising that bloggers have some of the most current looks and are 'fast-fashion' they are ready to create looks on any client that channel the trends showcased. Andro Mono - Created with a heavy wedge and a short cropped underneath, leaving an asymmetric side defining facial features. The cut works a feminine edge on an otherwise masculine style, Short and sharp, the perfect take on the shorter style we've seen celebs sporting lately. Colour wise, a line of shine is used to accentuate the cut and show the clean, crisp lines of the style. An almost black colour is used as a base with the reflective strip of shine taken a few shades lighter to really help the light bounce. Colour Clash - A double colour technique to really showcase the sharp lines of the cut. A gorgeous red is used for the top, with some of the darker colour sneaking through in a panel hidden underneath. The darker colour is used on the shorter cropped length, whilst the red helps to show the longer length with clean lines between the two. Perfect for ladies with short hair who want something to stand out from the crowd. The red was bright with multifaceted tones shining throughout. Denim Folk - Using 'scorching' to create a wonderfully soft effect on the ends of the hair. The cut is commercial, a long layered style with a fringe that can be worn full or swept to the side for a carefree casual finish. This 70's cowboy folk style looks great worn straight and sleek or with curl to help add texture to the hair. Clearly inspired by the 'ombre' stylings seen on celebs and the high street, I love the blonde against the warmer copper tones on the ends. Graphic Pop - Twiggy eat your heart out! 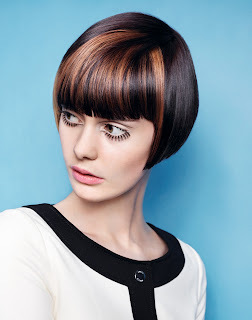 A totally 60's inspired look with thanks to Indola a colour freshen up. A sharp, simple bob worn with a blunt fringe perfectly shows off the neck and jawline. Rich brown all over colour, with warmer golden to copper tones edged into the underneath of the sides and front to bring a multi tonal finish to the hair. The sharp angles are reminiscent of Vidal Sassoon and this clean style is perfect against the clashing vivid colours of the 60's. Urban Tribal - A clash of two worlds. The interesting cut with the hair left long and one length, and a cropped fringe to frame the face. 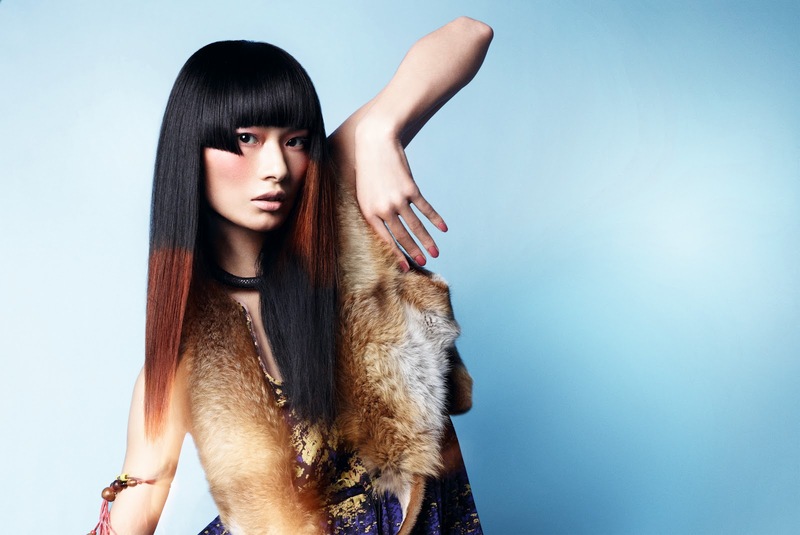 Colour is used sparingly in panels and slices to warm hair using earthy shades. Sleek and individual to the wearer the rich colours used create shine, and using a serum to finish will only enhance the gloss. Having been lucky enough to see the trends firsthand at the launch, I have to say the Denim Folk along with Andro Mono are by far my favourite looks. I loved the colouring and the cut, both work well to compliment each other and I can see how they'd be adjusted to suit varying clients and their needs. I really think Indola are trying to take this collection straight down to the masses without a huge amount of adjustment, yes clients can change for a more subtle look if they'd prefer, but unlike other collections this is accessible and wearable. I've another post coming up that will definitely interest anyone studying or currently working as a hairstylist. It'll be worth a read even if you are just interested in learning more about the products you use and styles you can achieve. What's your favourite look? Would you go for bold colours or a peek-a-boo panel of colour?